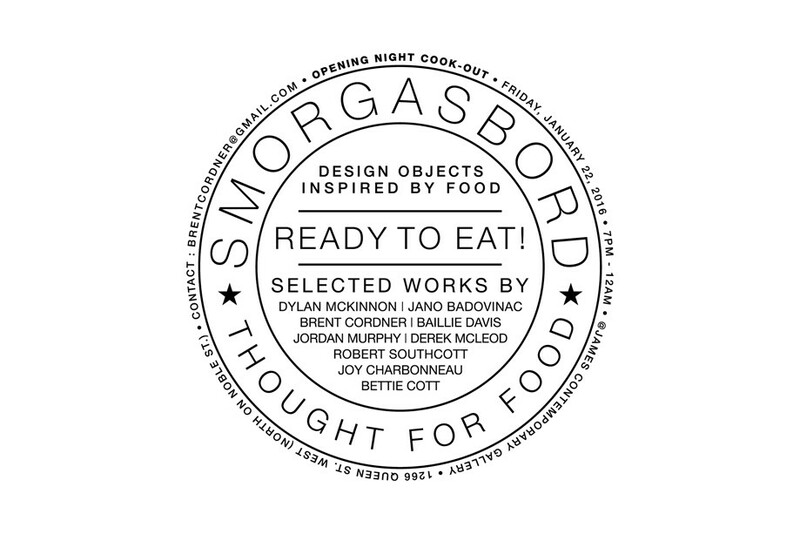 From the makers of previous hit shows Heavy Metal, Shiny Pretty Things and Light It Up, comes SMORGASBORD, a design exhibition devoted to food. Ten designers were asked to contemplate food as a theme for design. The complexity of food as a topic stems from the tension between need and pleasure; its deprivation causes pain while its abundance is either cause for joy or an inducement to vice. Add to this consideration a density of social activity and a rich associated material culture, and an ample territory for design experimentation is provided. The social benefits of sharing a meal are remarkable. Is there any other activity that brings us together so thoroughly? The simple act of ‘Having a bite,’ is the starting point for numerous social occasions, from the casual to the formal. It can be a first date, a business deal, a fuel-up before a workout, a chance to reconvene, and on… Families pass down recipes as heirlooms because those dishes trigger fond memories of a shared history. It cements the larger community by providing a reason for public activity. Farmers’ markets, street festivals, pic-nicks and barbecues are essential parts of culture around the world. And from this outpouring of creativity, comes cultural identity. Cooking methods become valued by peoples and then associated with place. Signature dishes are folded into national identity. These cultural practices are sought out by tourists, recorded in cookbooks, and transmitted by digital media. Our designers were asked to consider all aspects of food from farm, to plate, to compost. A survey of associated activities includes from start to finish: cultivation, transport, storage, display, preparation, service, consumption and disposal. Beyond utility, issues concerning representation, communication, setting and ambiance, and sensibility also avail themselves as topics of consideration. It is an interesting phenomenon that a meal can be rustic, or expedient, or lavish, or experimental… and the tools and vessels, and the setting are expected to be imbued with similar characteristics. It takes a deft hand and careful consideration to negotiate the requirements of utility and cultural expectation, while simultaneously inventing new form. The pursuit of excellence in cooking is as devotional as it is in any other art. Presentation and form-making in food are as essential as flavor to the experience of the meal. In keeping with this, our designers were encouraged to both satisfy need and enhance experience. The result is this collection of objects, diverse in response and rich in outcome.